How do you steel yourself against a random universe that seems determined to turn you into an accidental killing machiner? SHERI AMOURR, the director who brought you such live downtown stage musicals as The Goblin King's City, A Swimming in the Head and Rocky Horror at the Firehouse, joins forces again with SERENE DOMINIC (writer of A Swimming in The Head) to bring you DARK LULLABY, a new musical based on the 1945 film-noir classic Detour, even though Dark Lullaby's story arc goes from the mid 1970s to the late 1980s, leaving plenty of room fr stylistic musical genre-hopping, from rock to rap to disco. The show stars SKY DONOVAN as young Tom Reynolds was a once-gainfully employed guitar player trying to get to the West Coast to reunite with his actress girlfriend Joanna, played by RIVA FIGUEROA. See SHERIDAN WOOD as the femme fatale Lyndetta, determined to derail Tom at all costs and actor/rapper JOOBS as Roscoe Des Moines, the man of means who inadvertently sends Tom off on his downward spiral to the electric chair. Writer/co-director SERENE DOMINIC narrates as the older more incarcerated Tom while the SAN JACINTO DEATH ROW PRISON BAND serve as the show's pit orchestra. Through personal reminiscences, songs and flashbacks, we'll follow Tom Reynolds' unintentional killing spree across the United States which will result in four deaths, including a beloved pet which no one ever forgives Tom for killing. Allegedly. 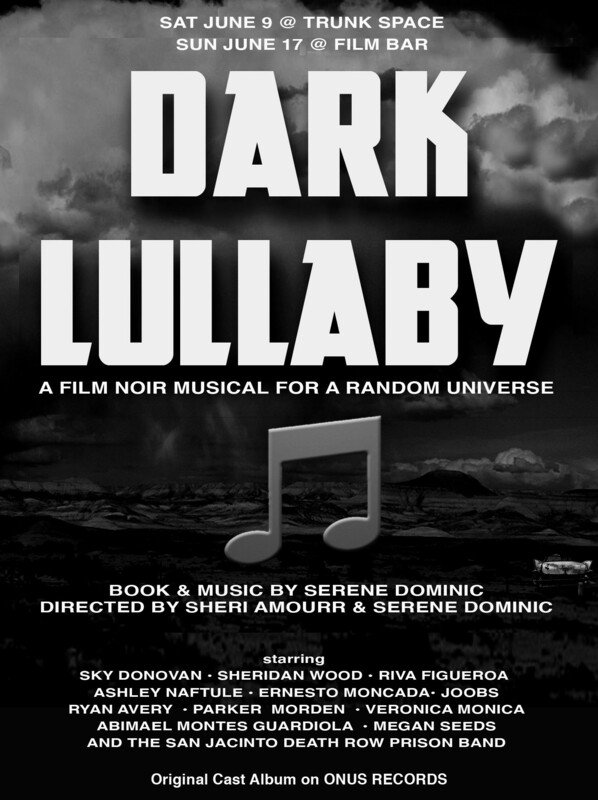 Coupling film noir tropes from the 40's with music based on rock, R&B and rap from the 70's and 80's, Dark Lullaby is a show with a timeless message for today, that it is a random universe, where love triumphs over all ( if you're lucky) and that the truth will set you free (if Ol' Sparky in the big house doesn't get you first).